Sit comfortably in the bucket and throw the Easter eggs to the position you want to reach. Click on the screen to teleport to the position of the egg and complete the level collecting all carrots and avoiding the gaps. Easter is a common holiday and egg madness is everywhere around. 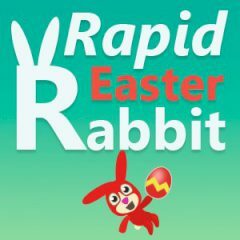 This red rabbit has some varicolored eggs and they have a magical effect of teleportation. You find it entertaining to hunt all carrots of the level lying in the comfortable bucket. Throw the egg and teleport to it with the click. Mind that there are many obstacles so throw and teleport carefully.